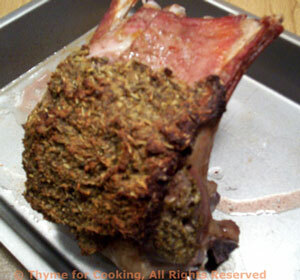 Rack of Lamb with Herbed Crust, Thyme for Cooking elegant main course. You can substitute a pork tenderloin for the lamb, if you prefer, or use lamb or pork chops, rubbing the herb crust on one side and baking for 10 - 20 minutes on a baking sheet. If a rack of lamb isn't in the meat counter you may have to ask your butcher... I do! If there is a thick layer of fat on the rack it should be removed - but normally your butcher would have already done this - just a warning. Mix butter, mustard and herbs. Put rack 'herbed' side up in a roasting pan and roast for 30 minutes in a 425F (215C) oven.